Across borders and oceans. To modern metropolises, ancient cities, and remote villages. To research sites and communities that need a helping hand. The thing I’m most proud of is my ability to refuse to give up. Alex speaks: You have to challenge yourself to find out what you’re capable of. If you spend your life just being comfortable, you’re not going to grow as a person. I decided to go to Greece to student teach kind of on a whim. I had always wanted to study abroad. This was just an awesome opportunity to student teach in a different culture. I met so many cool people that I never would have had the opportunity to meet otherwise. Aysha speaks: Being in Bloomington has enriched my life because there’s just so much to do. Like, I’ve had a lot of first time experiences just hanging out in Bloomington that I haven’t had anywhere else. I’m only one person, but to share my experience might encourage someone else. The world is not from California to South Carolina, it’s one end of the world to the other end of the world and everything in between. My study abroad program was unique because it was two weeks and it was also literally on the other side of the world. I spent a few days in China, I spent a few days in South Korea, and also a few days in Japan. So to go on the other side of the world for my first experience abroad was amazing. I was actually somewhere I could only dream of being. Allison speaks: I definitely want my future to be full of learning and traveling and meeting new people. I think I’m most proud of the community that I’ve developed here and the support system that I’ve developed with my friends and my professors and my internship opportunities that I’ve had and they’ve all had a deep impact on what I’m doing. I studied abroad in Buenos Aires, Argentina. I got to work directly with one of the human rights organizations that brought down the dictatorship and a lot of study abroad programs I’ve heard don’t let you have that up close and personal contact. I always wanted a school that I knew had a good reputation for foreign languages and opportunities for study abroad. I was really worried about studying abroad for an entire year, but I ended up graduating with three majors and a certificate. Mother speaks: It is an experience my husband and I will never forget. Father speaks: We sent a boy over to Greece and within no time we saw a man develop through this program. Mother speaks: I mean just a huge change in him. Father speaks: Would I recommend it? In a heartbeat. We actually, during our visit, got to sit in on one of the classes that he taught and that was very inspiring to see what he had developed. To live it with your child? Wow. Aysha speaks: I know this is cliche but it’s life changing. You’ll never have any experience like it. So I would say go for it. IU provides tons and tons and tons of resources that you need to go for it. Allison speaks: Life does not let you choose, so when you get to choose, you take advantage of it and do it. It’s the way everything has come together and had the opportunity to meet the right people at the right time who encouraged me to do the right thing and choose the right opportunities. IU offers international programs in nearly every program of study. In addition to learning about other cultures and practicing your language skills, overseas study can help you make progress toward your degree and get career-related experience. Complete an internship. Attend a conference. Do research. Advise entrepreneurs in emerging economies. Explore media and culture in China. The possibilities are virtually endless. Through Hoosier Alternative Breaks, you can use your winter, spring, or summer break to get international experience in doing good. 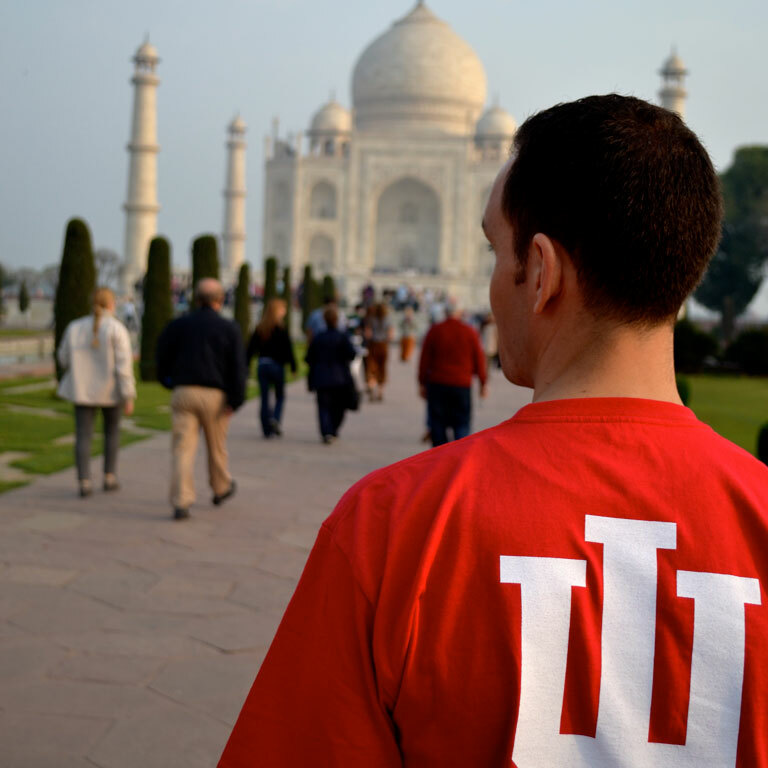 Some IU schools offer additional overseas service trips. Study abroad is just part of our international ethos, which includes globe-spanning programs and a world of cultures on one campus. The IU Hamilton Lugar School of Global and International Studies is another great way to explore your international interests. The school combines IU’s long-standing strengths in languages (including four Language Flagship programs, the most in the nation), area studies, and addressing global challenges.